There are 7 resorts in Waikiki that are on ocean front beaches. The Hilton Hawaiian Village has the largest beachfront including a salt water lagoon that is perfect for children. Waikiki offers a wide variety of hotels and condos with entertainment and dining. The * indicates the star ratings. Click on the hotel name to link to more information. Aston Waikiki Beach Hotel ***! 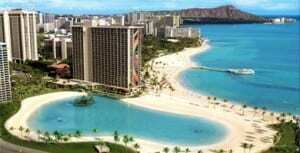 Book reservations for Oahu resorts and vacation condos with us. We can research  rates and availability for Waikiki Beach on the South Shore which is the most popular destination on Oahu. The West Shore and North Shore offer the Turtle Bay Resort and the Aulani Disney Resort. Click on the links listed here for more information about each property. Rates are based on availability at the time of booking. The star ratings are shown to assist you in narrowing your search. Travel Guide to Hawaii is affiliated with the largest wholesale travel consolidators in the U.S. We make it easy to plan your vacation and our rates are lower than those offered on the hotel websites. If you find a lower rate on the hotel’s website we can match it. Packages include air, hotel, car, activities, travel insurance and a payment plan. Call Rose at 808-330-6865. If you go to voice, please leave a message, I will call you back asap. Two of the most visited sites in the state are Pearl Harbor, near Waikiki, and the Polynesian Cultural Center on the North Shore. Transportation from your hotel to these sights is arranged through our activity desk. Visitors to the Waikiki Beach resorts can take a shuttle from the airport to their hotel. After a long flight it is easier to get to the hotel on the shuttle than to rent a car. Taxis and buses are plentiful so a car is not necessary within Honolulu City Limits. Visitors to Oahu experience Hawaii’s cultural heritage in music, dance, stories and historical sites. The Waikiki Beach District is on the south shore. The ocean conditions are calm and warm year around. Things to do and see on Oahu are many. The Oahu resorts in Waikiki provide daily entertainment in the lobby or on the beach. The Hilton Hawaiian Village puts on a fireworks display every Friday evening. Each resort has music and dancing daily in the lounge. We book vacation packages to all of the Hawaiian Islands. Call us for a free consultation. Selecting the best Oahu resorts or condos is our specialty. Oahu vacation packages include flights, car or airport transfers, accommodations, activities and island hopping tours. Complete the form to the right and give us a call.